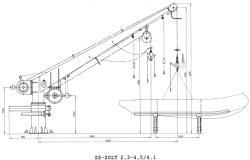 The davit arrangements type ZZ-ZOLT are included in the life-sawing and rescue equipment of vessel and can be used for lowering of life rafts or inflatable/rigid 6 person rescue boats. The arrangement operates at vessel's heel up to 20° at either side and trim up to 10°. 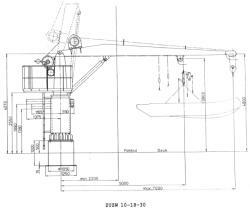 The davit arrangement consists of the radial davit type ZOLT, boat/life raft winch, lifting hook for the rescue boat and automatic hook for a life raft, rigging and the stand for rescue boat. The davit is provided with remote control of winch brake from inside the launched rescue boat or life raft. The davit arrangement type ZZ-ZOLT is included in the life-saving and rescue equipment of vessel and can be used for lowering of life rafts or inflatable/ rigid 6 persons rescue boats. The arrangement operates at vessel�s heel up to 20o at either side and trim up to 10o. The davit arrangement can be used for lowering and hoisting a cargo at vessel's heel up to 5° at either side and trim up to 5°. 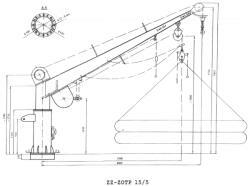 The davit arrangement consists of the radial davit type ZOLT, boat and life raft winch, lifting hook for the rescue boat and automatic hook for a life raft, rigging and the stand for rescue boat. Additionally the davit is fitted with a hook for a cargo. The davit is provided with remote control of winch brake from inside the launched boat or life raft. 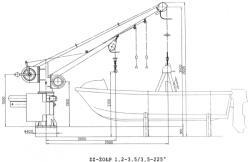 The universal davit with adjustable outreach ZUZW 10-18-30 is included in the life - saving and rescue equipment of vessel and is intended for the launching of life raft or for the launching and recovery of rigid or inflatable rescue boats fitted with complete equipment and occupied by the permissible number of persons. The davit arrangements operate at vessel's heel up to 20° at either side and trim up to 10°. The davit can be used for cargo handling operations and can work in conditions of vessel's heel up to 5° to either side and trim up to 2°. The davit arrangement consists of the radial davit boat/life raft winch, rescue boat hook, automatic hook, block, foundation and rigging. 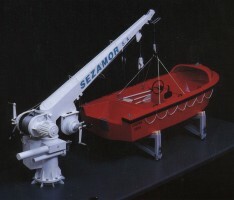 The davit is fitted with remote control for the slowing of the davit and launching of rescue boat or life raft. The davit arrangements are included in the life-saving and rescue equipment of vessel and can be used for lowering of life rafts or inflatable/rigid 6 people rescue boats. The arrangement operates at vessel's heel up to 20° at either side and trim up to 10°. The davit arrangement can be used for lowering and hoisting a cargo at vessel's heel up to 5° at either side and trim up to 5°. The davit arrangement consists of the radial davit, boat or life raft winch, auxiliary winch, lifting hook for the rescue boat and automatic hook for a life raft, rigging and the stand for rescue boat. Additionally the davit is fitted with a hook for a cargo. The davit is provided with remote control of winch brake from inside the launched boat or life raft. 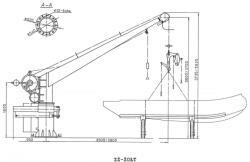 Davit ZOTPA is an element of life - saving and rescues equipment of vessel and can be used for lowering of life rafts. It can operate in conditions of ship heel up to 20° at either ship side and ship trim up to 10°. 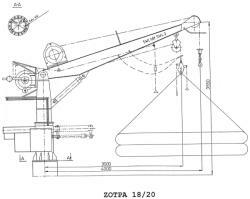 Additionally davit ZZOTPA can operate for cargo operations, on the load of max. 20 kN, in conditions of ship heel up to 5° at either ship side and ship trim up to 2°. The davit type ZOTPA 18/20 is equipped with life raft winch, auxiliary winch, automatic hook and ropes. It can operate with remote winch brake control, operating from lowered raft deck.